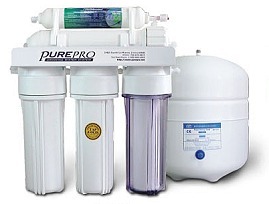 Reverse osmosis is highly effective in removing several impurities from water such as total dissolved solids, turbidity, asbestos, lead and other toxic heavy metals, radium, and many dissolved organic. The process can remove nuclear radiation such as radioactive plutonium or strontium in the drinking water. Therefore, reverse osmosis is the most advanced water purification method developed so far. You get quality & performance at prices that will surprise you! Since we introduced this economic unit to the market, the response has been an incredible success. Why pay more? Buy from the source and save money! Our EC105 comes complete with a NSF certified 3.2 gallons water storage tank, USA made membrane and all the necessary fittings, installation kits, extra color 1/4" tubing, and a long-reach chrome faucet.